The IRS recently announced proposed regulations under Internal Revenue Code (“Code”) Section 457 that update prior, final regulations issued in 2003 and other subsequent guidance from IRS. Section 457 governs deferred compensation rules for government employees, and for executives of private, tax-exempt organizations it permits deferrals from compensation over and above limits set forth in Code § 403(b). The proposed Section 457 regulations impact “ineligible” deferred compensation plans under Code § 457(f) more substantially than “eligible” deferred compensation plans under Code § 457(b) which were more comprehensively covered in the 2003 final regulations. 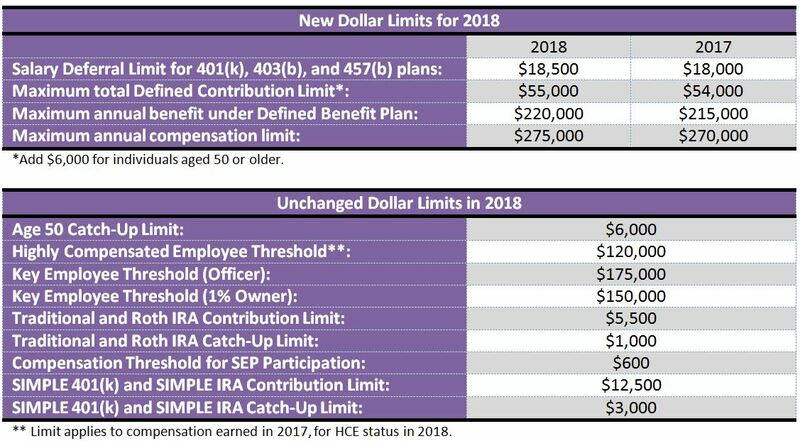 By contrast to eligible Section 457(b) plans, which limit annual contributions to $18,000, as adjusted for inflation (and without the age 50 catch-up for private non-profit executives), there is no dollar limit on annual contributions to a Section 457(f) plan (although as explained below other laws do set reasonableness limits upon nonprofit executive compensation in general). However, amounts set aside under Section 457(f) plans must be included in the executive’s taxable compensation once the amounts are no longer subject to a substantial risk of forfeiture, for instance upon completion of a vesting schedule, even if amounts are not physically paid out from the plan. Due to the requirement that income inclusion/taxation occur when the substantial risk of forfeiture lapses, Section 457(f) plans generally work best when retirement is in the fairly near future (e.g., 5 to 7 years out), and where vesting occurs on or near the anticipated retirement date. 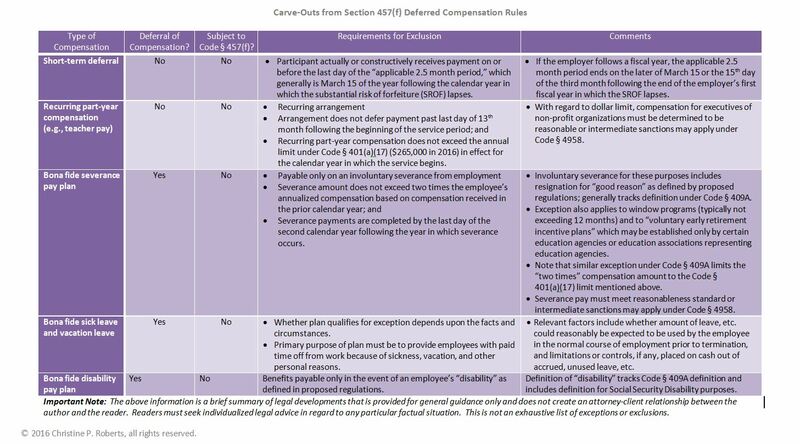 As summarized in the chart, below, the proposed regulations clarify how certain pay arrangements are carved out from Section 457(f) compliance, either because the arrangement is not deemed to provide for a deferral of compensation, or because it defers compensation but not in a manner that does not fall under Code § 457(f). Where no deferral of compensation occurs, the pay arrangement generally is also exempt from the “Enron rules” applicable to for-profit deferred compensation plans under Code § 409A, and related regulations. (Final regulations under Code § 409A were published in 2007; the second of two sets of proposed regulations were published the same day as the proposed Section 457 regulations). The proposed Section 457 regulations clarify that Section 457(f) arrangements generally are also subject to Code § 409A, although there are some important distinctions between the two sets of rules which I will address in a future post. On October 23, 2014 the IRS announced 2015 cost-of-living adjustments for annual contribution and other dollar limits affecting 401(k) and other retirement plans. A 1.7% rise in the September CPI-U over 2013 triggered $500 increases to the annual maximum salary deferral limit for 401(k) plans, and the catch-up limit for individuals age 50 or older. Citations below are to the Internal Revenue Code. –The annual Salary Deferral Limit for 401(k), 403(b), and most 457 plans, currently $17,500, increases $500 to $18,000. –The age 50 and up catch-up limit also increases $500, to $6,000 total. This means that the maximum plan deferral an individual age 50 or older in 2015 may make is $24,000. –Maximum total annual contributions to a 401(k) or other “defined contribution” plans under 415(c) increased from $52,000 to $53,000 ($59,000 for employees aged 50 and older). –Maximum amount of compensation on which contributions may be based under 401(a)(17) increased from $260,000 to $265,000. –The compensation threshold for determining a “highly compensated employee” increased from $115,000 to $120,000. –The compensation threshold for SEP participation increased from $550 to $600. –The SIMPLE 401(k) and IRA contribution limit increased $500 to $12,500. –The Social Security Taxable Wage Base for 2015 increased from $117,000 to $118,500. On October 31, 2013 the IRS announced 2014 cost-of-living adjustments for annual contribution and other dollar limits affecting 401(k) and other retirement plans. The announcement had been delayed until the September 2013 Consumer Price Index for Urban Consumers (CPI-U) was available, which in turn was delayed by the government shutdown over the budget and debt ceiling debate. A modest 1.2% rise in the September CPI-U over 2013 left a number of the dollar limits unchanged for 2014, although a few limits have increased (citations are to the Internal Revenue Code). –Salary Deferral Limit for 401(k), 403(b), and 457 plans remains unchanged at $17,500. The age 50 and up catch-up limit also remains unchanged at $5,500 for a total contribution limit of $23,000. –The compensation threshold for “highly compensated employee” remained at $115,000 for a second year in a row. –SIMPLE 401(k) and IRA contribution limits remain at $12,000. –Maximum total contribution to a 401(k) or other “defined contribution” plans under 415(c) increased from $51,000 to $52,000 ($57,500 for employees aged 50 and older). –Maximum amount of compensation on which contributions may be based under 401(1)(17) increased from $255,000 to $260,000. –Maximum annual benefit under a defined benefit plan increased from $205,000 to $210,000. –Social Security Taxable Wage Base increased from $113,700 to $117,000. –The dollar limit defining “key employee” in a top-heavy plan increased from $165,000 to $170,000.